We are in Cartagena, Bolívar. We decided to leave Cream Puff in Santa Marta and travel by land. There are a couple of reasons for doing this. First, the marinas in Cartagena did not have good reviews and a weekly stay is quiet expensive (we are getting a very good rate in Santa Marta). Second, according to some of the safety web-sites we follow, boats left in the anchorage unattended are subject to break-ins. This was not by any means the norm for the area but it was enough to make us take note. This area was just a little too iffy for us. We know of a rally of about 50 boaters who recently sailed to Cartagena and they posted on FaceBook about how the Colombian Navy patrolled the anchorage whilst there. Suffice to say, we don’t have that amount of clout being just one boat. We prefer places where the Navy is not needed, at all. Also, when on anchor, we need a secure place to leave the dinghy while we wonder about the town. Options for this are few. We did not want these negative issues to sway us from skipping what is known to be a “must do” tourist stop while in Colombia. Millions of people from all over the world visit Cartagena and we wanted to know why. After looking at our options, we decided to leave Cream Puff in Santa Marta as the marina is very secure. They have security guards who patrol the docks 24/7 and a fingerprint scanner is the method of access to unlock the gates to the piers. The fingerprint scanning technology hardly works when you have the correct print in the scanner. Often, it requires us to insert our finger more than five times before the gate unlocks. So with that in mind, it seems logical it would make it that much harder for crooks to access the area where boats are moored. In addition, we have made friends with several of the dockhands who will keep an eye on the Puffster while we are gone. We had no qualms about leaving for a week. Once we made the decision to bypass sailing to Cartagena, we needed to figure out how to get there. Cartagena lays about 230 km (140 miles) southwest of Santa Marta along the same northern Colombian coast. Our choices were: Plane, private car, taxi or bus. We both hate flying with a passion, perhaps me more than Cindy. That option was quickly dismissed. The private car was appealing and the marina offered to set this up for us. This would also be the fastest option of about 4 hours. 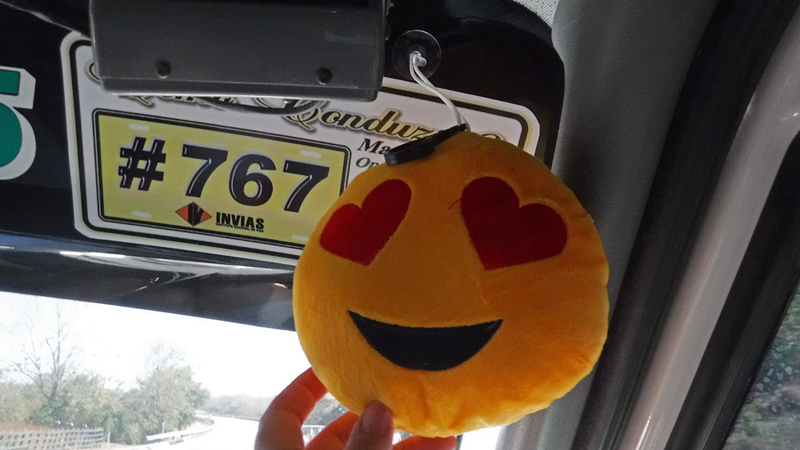 The car would drop us in Cartagena and then return in a few days to pick us up and take us back. The cost (US$ 200 each way) was a little more than we wanted to pay. This left us with two options; taxi or bus. We read on TripAdvisor how taxis are not really made for the long trip and will often breakdown. Based on the taxis we have used since being in Santa Marta, I could clearly see how a breakdown would be possible. Okay then, we’re taking the bus. The bus is like a shuttle bus. There are two main choices with buses. Both are private companies, Berlinas (Berlinastur) and MarSol. I think there might be a state or nationally run service but we couldn’t get clear details about it. The government run buses do not have air conditioning so those were not an option. Neither of the private companies had great reviews on TripAdvisor. Tourists pretty much picked apart both services for a multitude of reasons. Berlinas is a little bit more expensive than MarSol and according to TripAdvisor travelers worth the few extra pesos. We opted for Berlinas. 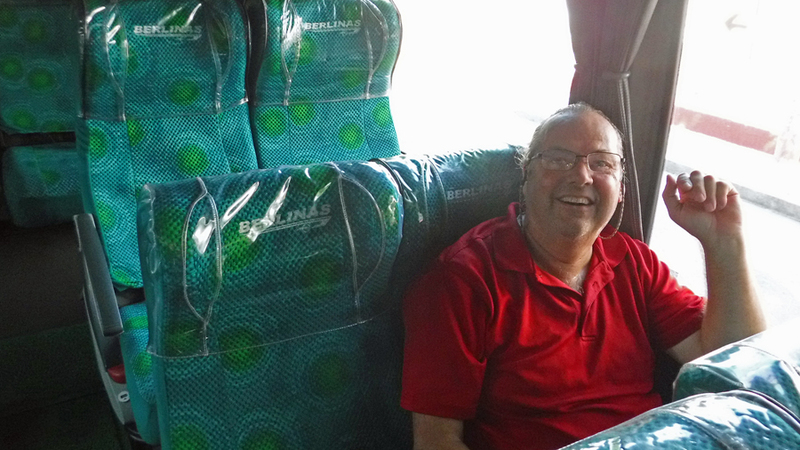 Our total fare one way was about US$14.00 (12.30€) each for the 5 hour trip. 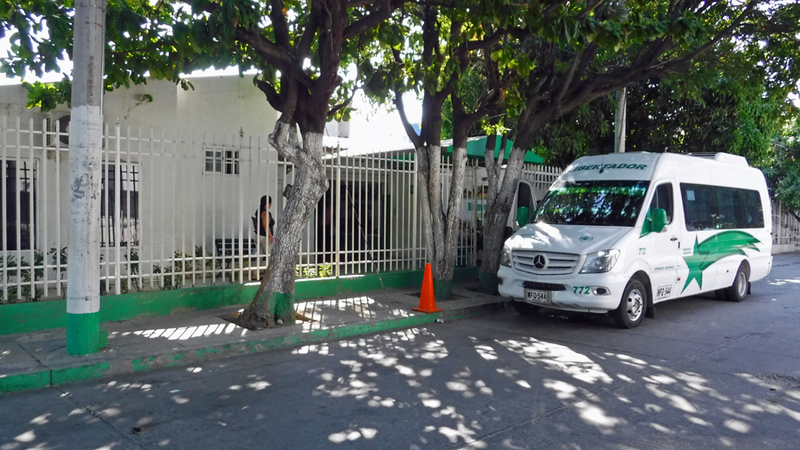 The Santa Marta bus station is in a residential neighborhood located in a converted house. So glad the taxi driver knew where to take us! 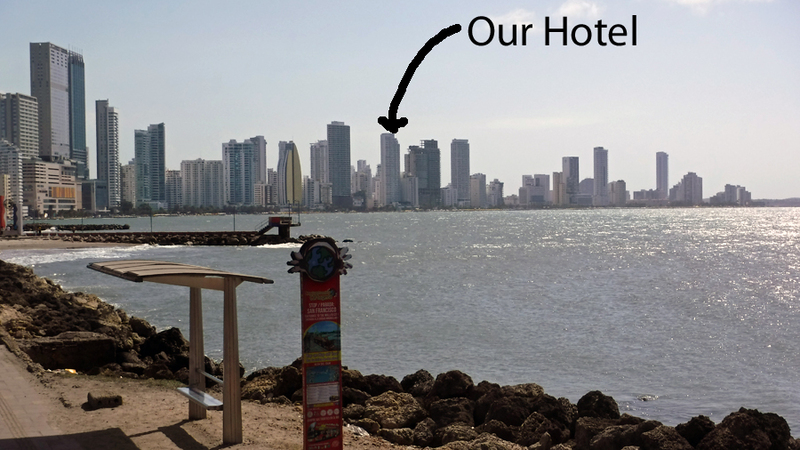 We decided to stay for 7 nights in Cartagena and began our search for accommodation. I initially thought we’d do an apartment booked on Airbnb/Vrbo. The thought process was we could eat meals in the apartment and save some money. Also, we both get really tired of restaurant food. After years of corporate travel, restaurants have lost their appeal and we much prefer to cook our own food. Several other cruisers we talked to recommended staying inside the historic Walled City. The main reason for recommending this was all the attractions would be within walking distance. Our other choice was a boutique hotel in the area. This was appealing to us but after we looked online we decided to go a different path. Just down from the walled area is a part of the city the locals refer to as the New City. We later found out in a tour this New City area was once an island and during the Dutch occupation of Cartagena they filled in the ocean and made it a peninsular. Think about how massive of a task this would have been in the 1500’s with men using shovels and wheelbarrows. The New City is like any other major city with high-rise buildings and shopping. With taxis being so inexpensive in Colombia we wondered if we could save more money by being outside of the touristy area in the New City, stay in a hotel and pay the $3 taxi into the walled area each day. This is the option we chose but also for one additional reason. We discovered tourists visiting Colombia do not pay sales tax on the hotels meaning we could save an additional 20% from the publish rates. We found a really nice centrally located hotel with a free breakfast. The hotel option was proving to be much cheaper than the Airbnb/vrbo options. Sold! The bus ride turned out to be an event unto itself. Keeping in mind our Spanish is limited to a very few words, we navigated the ticket counter. The system is a little bit antiquated but works very smoothly. No reservations and no online sales are available. 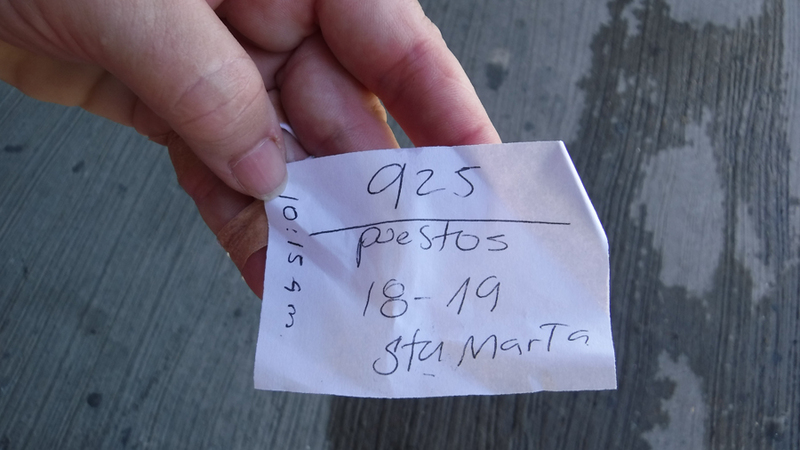 A passenger shows up at the bus station and purchases a ticket to the destination. It is at this time they tell you when the next bus departs, the bus number and your assigned seats. This is handwritten on a small piece of paper. Our understanding was people never really have to wait more than 20 minutes for the next bus. Our wait was less than ten minutes. 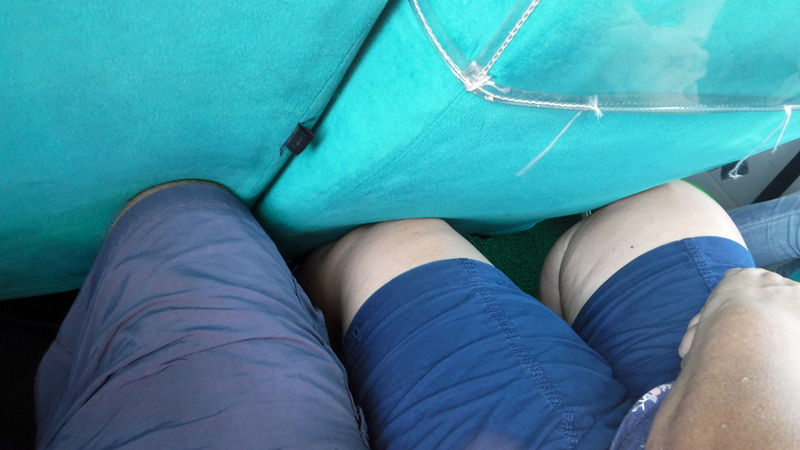 The bus was comfortable and offered about as much leg room as an airline. We were treated to English 80’s music for the first half of the journey. I found it really amusing to be barreling down the roads of Colombia listening to Rod Stewart. 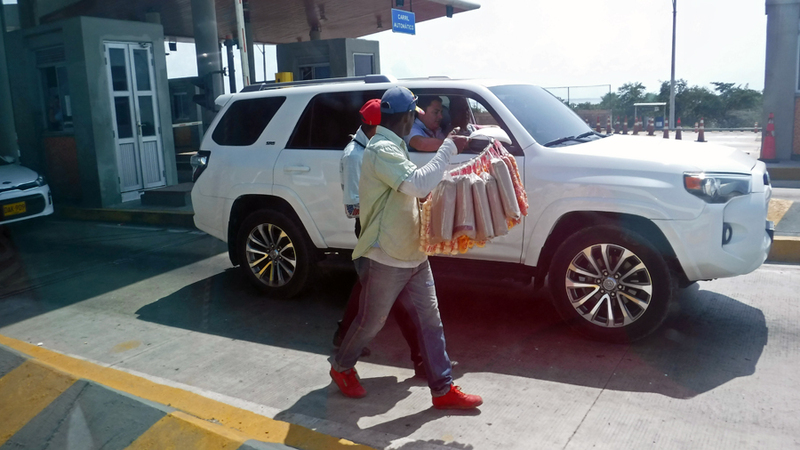 The roads between Santa Marta and Cartagena are mostly two lane roads meaning the traffic has to pass avoiding head-on collisions. This road is a major artery and has tons of slow moving trucks. Our bus spent an awful lot of time driving in the left lane (they drive on the right in Colombia). There were a couple of times where we saw what I thought to be close calls. However, the Colombians seem unfazed by the driving. 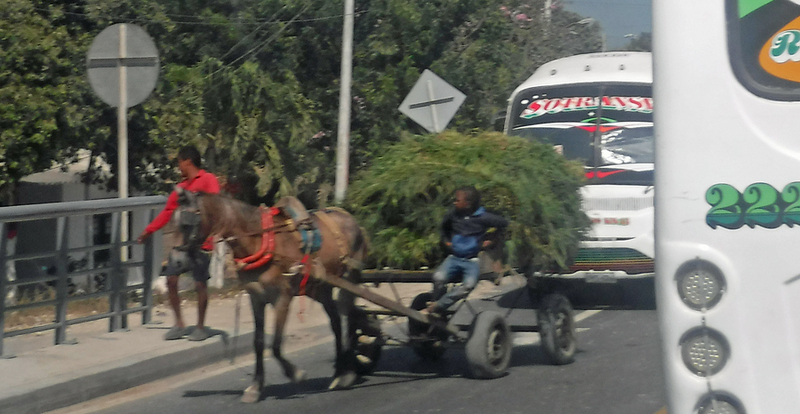 Imagine driving down a road at the speed of light and suddenly cresting a hilltop to find a cart being pulled by a donkey in your lane directly in front of you. This happened more than once. Again, the Colombians seem unfazed. 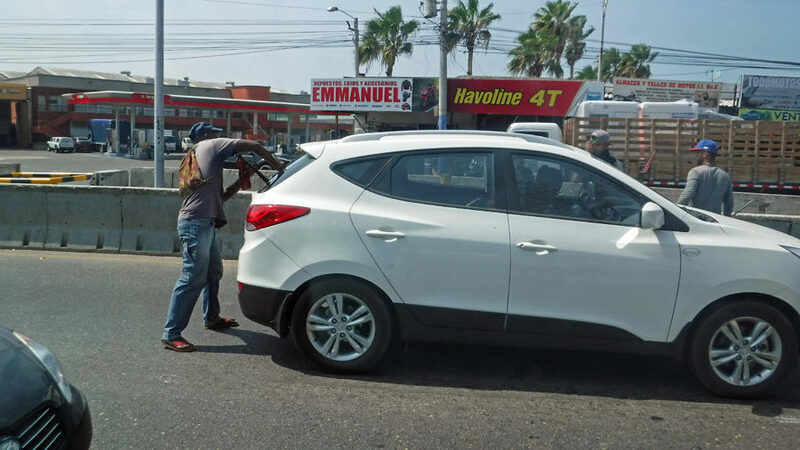 We made a brief stop in Barranquilla. This gave passengers a chance to stretch their legs and renew the circulation of blood to the feet caused by the lack of leg room. It also meant a pee break. The bathrooms in Colombia have attendants and cost 1,000 pesos (about 30¢). Cindy got the biggest kick out of the attendant’s presentation of the toilet paper assortment. Once she paid her money, the lady removed a lid to a box and waved her hand over it as if she were presenting a fine meal in a restaurant. There isn’t any paper in the cubicles. Toilet seats also seem to be in short supply. 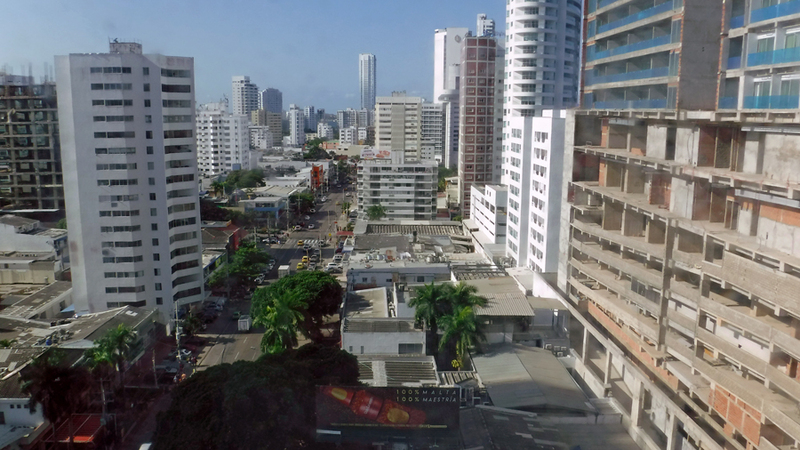 Barranquilla was the halfway point of our journey. At the bus station, we didn’t dare let the bus out of our sight since we had no idea how long the stop would last. I thought the driver might have said 15 minutes but I can only count to ten in Spanish. When we saw other passengers getting back on we made sure we were right there with them. On the second half of the trip we were treated to a movie in lieu of the 80’s music. The movie was, of course, in Spanish and didn’t have subtitles. It was a nature film showing the various beauties of Colombia. 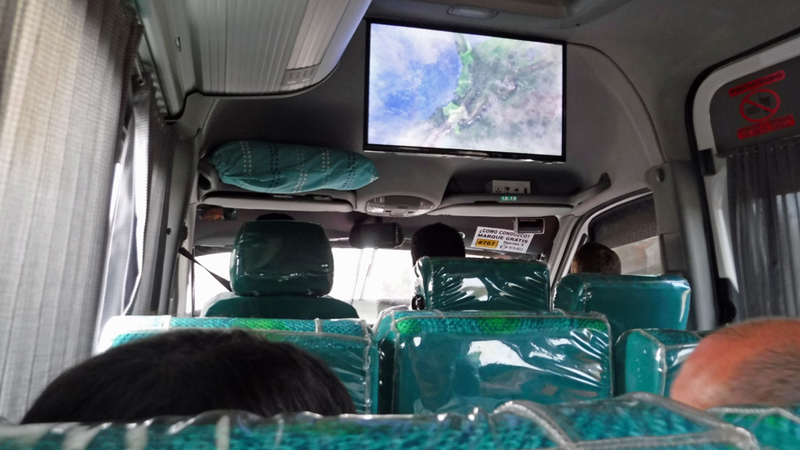 I personally think they show movies to calm the passenger by keeping them distracted and not looking at the traffic. In our lifestyle, often times the journey to a new destination turns out to be an adventure in itself. 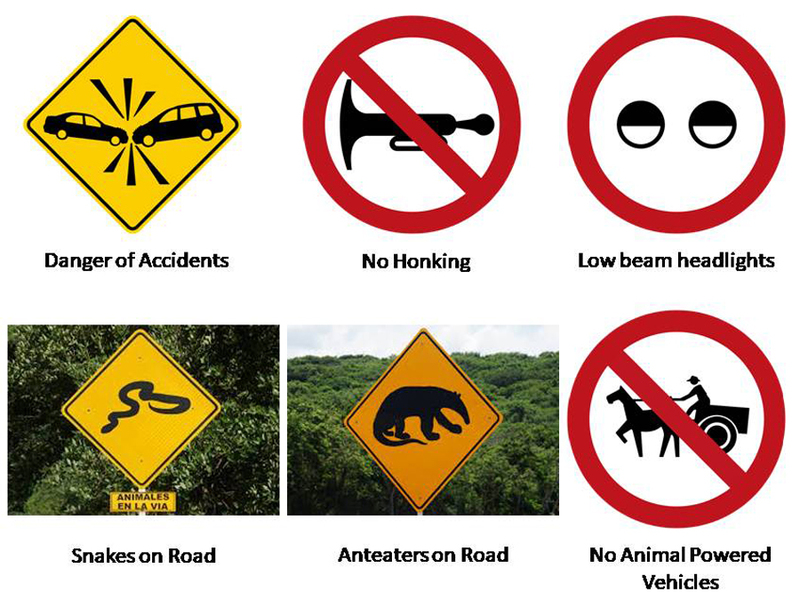 As we head out on this trip, I not sure what appeals to us more. We are off to see a city that is colorful, historic and alive with culture. We are also heading to a hotel for a week where we will have unlimited hot water for long showers and can flush massive quantities of toilet paper in the head*. Frankly, it is tough to know which has more appeal. * You need to be a boater to understand the toilet paper reference. Toilets on boats are mechanical and are located below the waterline meaning the waste has to be pumped upward into a holding tank before being discharged. There is a very fine line between using an adequate amount of toilet paper and jamming up the pump. Many boaters prefer to put the toilet paper into a separate container or bin since the ordeal of taking apart the toilet to unclog the pump really is not high on anyone’s list of favorite boating chores.